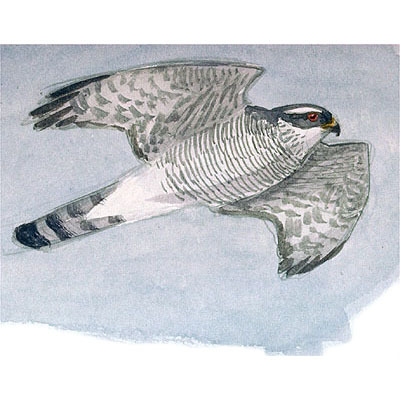 Accipiter gentilis can be distinguised from other raptors of the same size (L 50 cm) by its short rounded wings, long tail, brilliant white supercilium, lead-grey above and longitudinal white spots on breast. The subspecies arrigonii, smaller and darker, inhabits deciduous forests, coniferous forests and evergreen non resinous forests. Feed on birds. Resident. The subspecies is endemic of Corsica and Sardinia. The global breeding popualtion is estimated to be about 100 pairs. It should be noted that the population in Corsica is declined significantly. The main threats are the limited population, the loss and deterioration of habitat (overgrazing, fires, forest exploitation), illegal hunting and pesticides contamination.